To combat the impacts of cloudbursts, the City of Copenhagen developed a Cloudburst Management Plan in 2012, which is an offshoot of the Copenhagen Climate Adaptation Plan. The Plan outlines the priorities and measures recommended for climate adaptation including extreme rainfall. The City carried out an overall assessment of the costs of different measures (traditional vs different options including adaptation measures), the cost of the damages despite the measures and resulting financial impact. It was showed that continuing to focus on traditional sewage systems would result in a negative societal gain: despite capital investments, financial damages from flooding would remain high and not justify the high investment in measure implementation. On the other hand, the combined solution (including adaptation) would result in a net saving. The chosen combined solution will consist of expanding the sewer network and around 300 surface projects focusing on water retention and drainage. Copenhagen has experienced four major rainfall events in the past six years. The largest, in 2011, caused damage totalling more than DKK 6bn. This does not include direct costs of repairing municipal infrastructure or indirect costs such as loss of earnings, loss of business operation, rising insurance premiums or companies choosing to move away from the City of Copenhagen. According to the Copenhagen Climate Adaptation Plan, a primary challenge for Copenhagen in light of climate change is more and heavier downpours in the future. Precipitation is expected to increase, while at the same time rain events will decrease, resulting in more intense rain events and subsequent flooding. Using the IPCC projections under the A2 scenario, the Danish Meteorological Institute projects that there will be 25-55% more precipitation in the winter months in 2100, with decreasing events in the summer by 0-40%. At the same time, the intensity of heavy rainfall could rise by 20-50%. The Adaptation Plan points out that the intensity of rain with a 10 year return will increase around 30% by 2100, a change that would overwhelm existing sewage and runoff systems. An economic assessment of the costs of damage to Copenhagen if nothing is done to adapt the current runoff and sewage system is estimated around DKK 16bn over 100 years. Up to DKK 9 billion of this sum has already been “used up” in the recent major rainfall events. MIKE URBAN, a mathematical runoff model, was used to analyse existing conditions and project the impact of climate change on floods in Copenhagen. Multiple scenarios were assessed using the timescales 2010 (as the baseline), 2060 and 2110 and looking at the frequency of the future flood events (10, 20, 100 years) and whether climate adaptation measures are implemented or not. The results of the calculations are presented as vulnerability maps showing the variation in water depth for the flooded areas. The results of the model simulations for 2060 show that 10-year rain events would flood an area greater than in 2010 (58 versus 48 hectares) but that the implementation of new measures would minimise floods occurring due to 100-year rain events. The results of the scenario in 2110 looked at 100-year rain events and the differences in flooding with or without climate adaptation. With no adaptation, 742 hectares of the city would be flooded, with adaptation only 235 hectares would be affected. The objective of the Cloudburst Management Plan is to reduce the impacts of pluvial flooding due to heavy rains, which are expected to increase in frequency as a result of climate change. The plan builds on a detailed socio-economic assessment to ascertain whether cloudburst and stormwater management can pay off for society as a whole. Previously, sewer discharge was allowed to ground level once every 10 years. With the new management plan, sewer discharge will still be only allowed to reach ground level once every 10 years, but average water levels will lonely be allowed to exceed ground level by 10 cm once every 100 years (except areas designated for flood control). The City of Copenhagen has neither the capacity nor the economy resources to implement all measures at once. The Cloudburst Management Plan operates with a minimum time frame of 20 years, requiring a prioritisation of individual projects in line with the Copenhagen Climate Adaptation Plan. Green roads to detain and hold back water in smaller side streets. 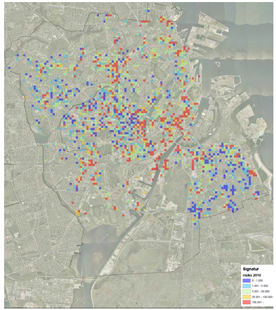 High risk areas: In connection with the Copenhagen Climate Adaptation Plan, a risk analysis was prepared. The results were presented as a risk map pinpointing the city areas with the highest risk of flooding (expressed in DKK) and, consequently, where adaptive measures would have the biggest effect. Areas where measures are easy to implement: Areas where, by applying relatively simple measures, pluvial flood water can be drained to localities where it will not impact. These would be areas close to the harbour such as Ny Kongensgade and Ved Stranden where pluvial flood projects were carried out in 2012 to protect the areas against flooding by making openings in the quay thereby allowing the rainwater to drain into the harbour. Areas with ongoing urban development projects: The costs of pluvial flood projects can often be reduced considerably if they are implemented in conjunction with renovation projects and new urban development projects (e.g. road renovation). Areas where synergistic effects can be gained, e.g. 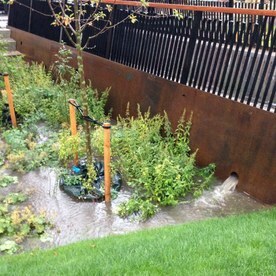 by combining flood risk initiatives with those of other urban schemes such as local authority water directives. An assessment of the risk of flooding in the event of more rain and torrential downpours as well as the costs of damage it can cause over the next 100 years if we do nothing (“business as usual”). A calculation of construction and operating costs in the traditional solution (sewers) and the combined alternative solution. A comparison of the costs in the two solutions and the gains in reducing damage in the city in relation to “business as usual” (cost-benefit analysis). This calculation provides an answer to the question as to whether the solutions are advantageous in relation to doing nothing (“business as usual”). A comparison of the traditional solution and the alternative solution in relation to the specified service objectives (cost-effectiveness analysis), which provides an answer to the question as to what solution is most advantageous if there is a wish to meet the municipality’s service objectives. The assessment took into account a net charge factor of 17% and a tax distortion loss of 20% within the estimated construction costs. Since the solutions are implemented gradually over 20 years, 1% is added per year in operating costs for the surface solutions and .5% per year for other solutions. The assessment found that while both the traditional sewer solution and the alternative solution meet the municipality’s objectives concerning stormwater and cloudbursts, the alternative solution results in higher net benefits. The traditional sewer solution has been estimated to cost DKK 20 billion compared to the DKK 13 billion of the alternative solution. Both solutions would reduce the costs of damage by DKK 16 billion; thus, the net gain of the alternative solution is DKK 3 billion compared to the net loss of the traditional solution of DKK 4 billion. To illustrate the uncertainties in the economic assessment, a supplementary calculation was made of the alternative based on the Finance Ministry’s guidelines from 2013 concerning socio-economic discounting. The calculation shows that the total damage rises from DKK 16 billion to DKK 18 billion over 100 years and that the net gain also rises from DKK 3 billion to DKK 5 billion. This result is due in particular to the Ministry of Finance’s discounting attributing greater weight to reductions in damage further in the future. Case developed and implemented as a CCA (Climate Change Adaptation) Measure. The Cloudburst Management Plan developed by the City of Copenhagen was coordinated with Køben-havns Energi (Copenhagen Energy), the City of Frederiksberg, and Frederiksberg Forsyning (Frederiksberg utility company), since all rainwater falling in Frederiksberg during an extreme rainfall event leads to either a sewage treatment plant or into the sea via the City of Copenhagen. Furthermore, collaboration was initiated with neighbouring local authorities who lead surface water and waste water through the city to the common sewage treatment plants or to common water courses and lakes. Projects will need to be carried out on private roads. 132 km of private roads (around 30%) have been included in the plan, and road-owners can decide whether projects will be implemented. It may be necessary to purchase roads considered crucial to the management (currently 9km of roads have been identified). The plan may impact conservation goals. An initial analysis of the environmental impact of the plan has taken place and there is a possibility to get exemptions from the Conservation Board in a couple areas. The prioritisation of the projects emphasizes large-scale projects, which will require cooperation between municipalities and also private land owners. Stormwater will need to be treated to ensure a proper water quality; solutions are being tested. Surface solutions will cost an estimated DKK 4.975 billion. The costs of municipal and the private co-financing projects will be reimbursed through water charges. Cloudburst pipes will cost an estimated DKK 2.66 billion, covered through water charges (HOFOR). Disconnection and connection outside property boundary will cost around DKK 1 billion, covered through water charges (HOFOR). Protection of homes with anti-flood backwater valves and disconnection within property boundary is estimated at around DKK 2.4 billion, financed by landowners. 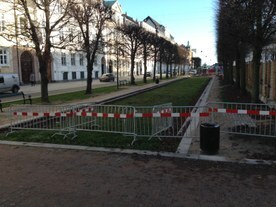 The option of urban space improvements will cost around DKK 1 billion and will be financed by the City of Copenhagen. The estimate covers the total costs incurred by the City of Copenhagen, Capital Area Supply Company (HOFOR) and private landowners. The utility companies Frederiksberg Forsyning and Nordvand are part of the solution in Copenhagen because cloudburst management in these municipalities are dependent on the Copenhagen solution and vice versa. If these utilities contribute DKK 900 million, the construction estimate of the combined solution amounts to DKK 12 billion. The part of the combined solution concerned solely with managing water (hydraulic function) can be financed through the water charges. Water charges will increase to cover these costs. It has been estimated that the water charge of a household consuming 110 cubic meters water annually would increase by an average of DKK 890 per year. The combined solution additionally necessitates private individuals to invest in anti-flood backflow valves etc. and local drainage of stormwater. If the implementation of the cloudburst and stormwater management is coordinated with other construction projects in the city, up to DKK 1 billion can be saved over the whole implementation period. The cloudburst management plan will contribute to rises in property values and increased employment. It is estimated that the urban space improvements with recreational value will increase property prices in Copenhagen of just under DKK 1.4 billion. The upgrading of urban spaces can also increase revenue from property tax due to a significant increase in the value of those properties that are adjacent to the parks. Over 100 years, this extra revenue will amount to a value in present-day prices of DKK 1 billion. However, the equalisation system at present is structured in such a way that 66% of property tax revenue in Copenhagen is included in the equalisation and consequently goes to other municipalities. Total employment of more than 13,000 full-time equivalents with DKK 1.6bn in tax revenues can be created in the construction phase. The tax revenue created as a result of additional employment in the building and construction industry always accrues to the municipality in which the employee is resident. It has therefore not been possible to calculate the effect in the City of Copenhagen alone. If the construction of facilities for urban space improvements is additionally included, the number of new full-time equivalents will rise to more than 15,000 and tax revenues to around DKK 2bn. The assessment shows that under present-day circumstances we can expect an overall benefit of DKK 5bn from the combined solution in Copenhagen in comparison to a situation in which the City does nothing. The socio-economic benefit by choosing the combined solution compared to the traditional sewer solution is around DKK 9bn. The socio-economic assessment makes a comparison of the costs of the two solutions and benefits to be made from reducing damage in the city in comparison with the business as usual approach, as well as analyses the cost-effectiveness for addressing stormwater concerns. Present legislation on the environment and waste water does not provide sufficiently for the optimal handling of increasing quantities of pluvial flood water seen from an environmental and financial perspective. The City of Copenhagen has, therefore, tabled a number of proposals for amendments to be considered by the Danish Ministry of the Environment. City of Copenhagen proposals for amendments primarily concern amendments regarding payment rules relating to waste water and the Planning Act in Denmark. Existing legislation obstructs the implementation of measures where existing roads will be used as flood ways for pluvial flood water. This is because the utility companies are only allowed to finance projects relating directly to waste water handling. A flood risk solution where roads, for example, were to be used to drain pluvial flood water cannot, with the present legislation, be financed by revenues from charges. If Københavns Energi (Copenhagen Energy) and Frederiksberg Forsyning (utility company) are to implement these measures, it will be necessary to designate the roads, in part, as waste water plants. This, however, is not feasible with the present Payments Act, Roads Act, and Environmental Protection Act. From 2013-2014 the management plan was detailed, including proposal for solutions in each of the 7 water catchments. The proposed solutions have been broken down into 300 projects, which are only starting to be implemented now on a yearly basis. Around 100 years for the sewage system; indefinitely for the parks created.